Hey there, Tree fans — Dollarista here again! 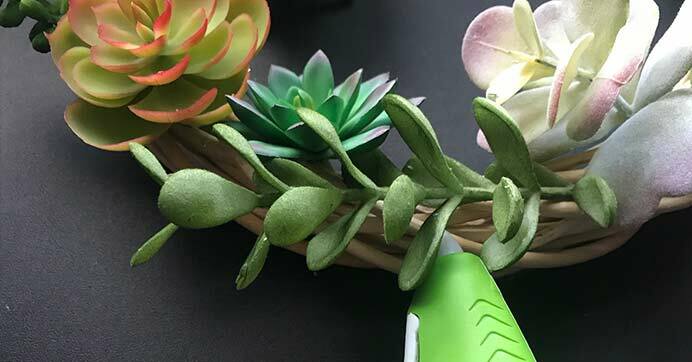 As you know, I’m a big “succa” for new and frugal finds, so when Dollar Tree got these life-like succulents, I just had to create something amazing with them. 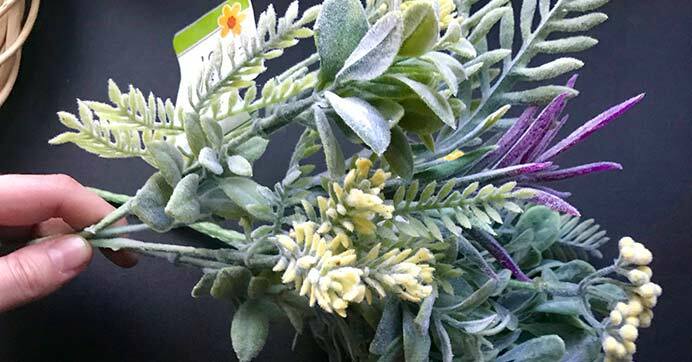 And, c’mon… who could pass up succulents for just $1? 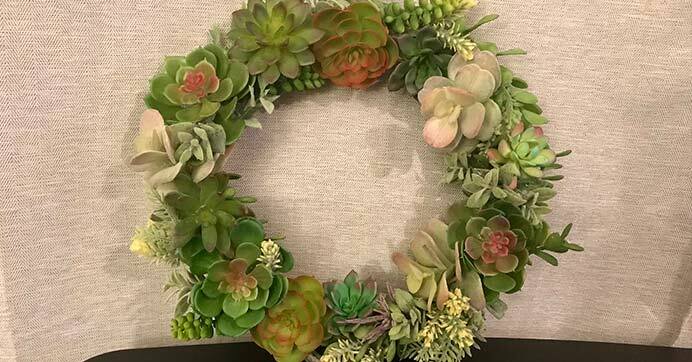 First, decide whether you want to cover the entire wreath form with succulents or just a portion of it. That will determine how many succulents you’ll need to have on hand. 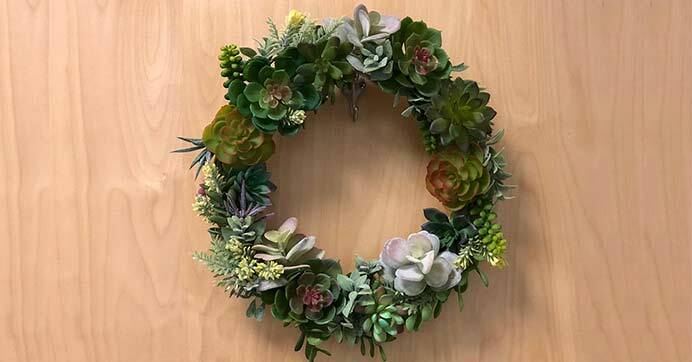 I saw some adorable wreaths on Pinterest that had succulents on the bottom right only, but I decided to go ALL in and cover the entire wreath. I’m the Dollarista, what do you expect?! I started collecting succulents over various Dollar Tree hauls, and when I gathered them all up to start crafting, I had about 15. Like I said, you could always go for less or more, it just depends on what look (and price) you’re going for. 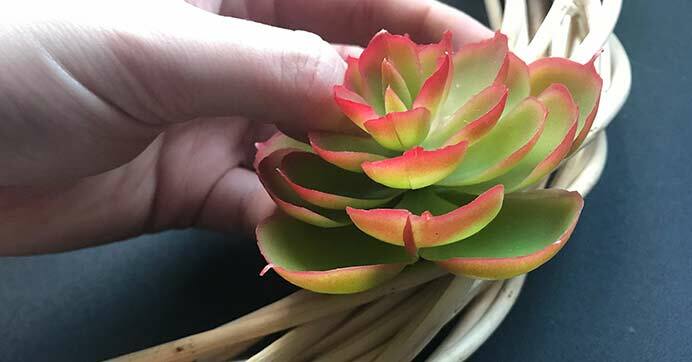 If you’re using the potted succulents, you’ll need to pull these out of the mini pots. It’s super simple and they come right out. Time to get creative! 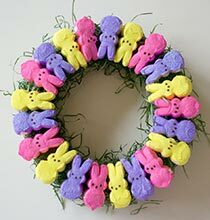 Start placing the succulents on the wreath form however you’d like. 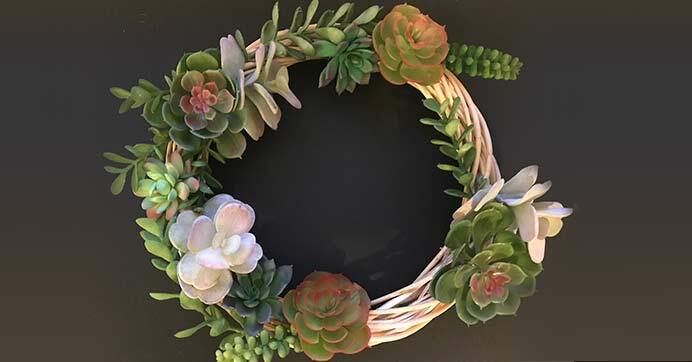 This actually turned out to be a lot easier than I thought because the stems of the succulents go right through the wreath form. You may have to play around with it and find good open slots to stick the stems through. If you can wedge the stem in there tight, then you don’t really need hot glue. However, if it’s a looser fit, you’ll want to add a few drops of glue to make sure that succa stays in place! 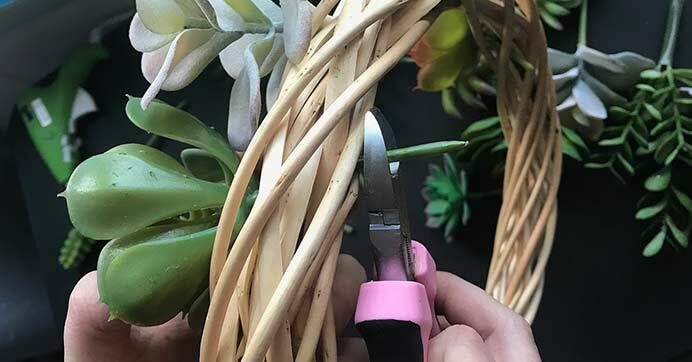 As you stick the succulents through, you’ll notice the stems on the succulent picks are a lot longer than the ones you pulled from the pots. This is where your pliers or scissors come in handy! 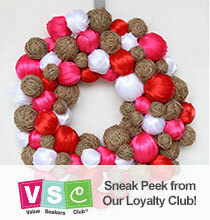 If the stem sticks out through the back of the wreath form, simply snip the excess stem from the back of the wreath. A few of my picks were similar to burro’s tail succulents (yes… I Googled), which are longer and vine-like. 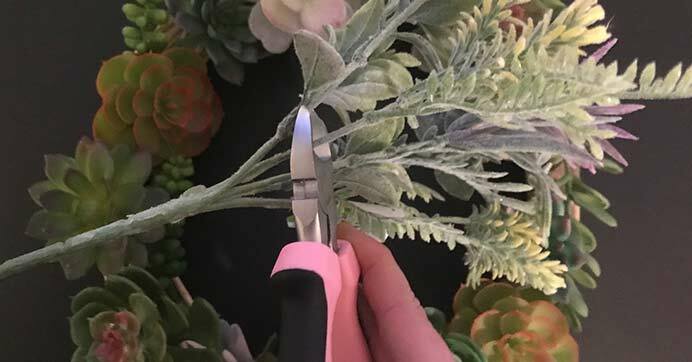 If you’re using some of these, place the end of the stem through the wreath like you did the others, and then curve it around the form and use hot glue to secure it in place. Once all of my succulents were in place, there were few small spaces here and there where you could still see the wreath form. To fill in these gaps, I was originally going to use floral moss, but I ended up using these floral stems I found on my last Dollar Tree trip that I fell in love with! 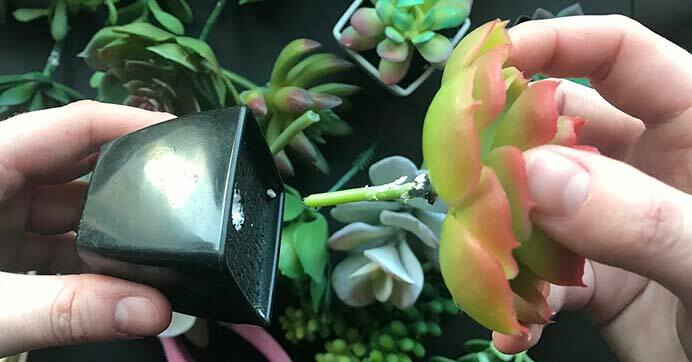 Using my pliers, I snipped off a few pieces and hot glued them in the gaps between the succulents. 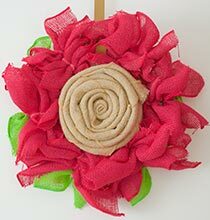 Let everything dry for a bit and there you have it — a beautiful, versatile, affordable wreath for any season or occasion! 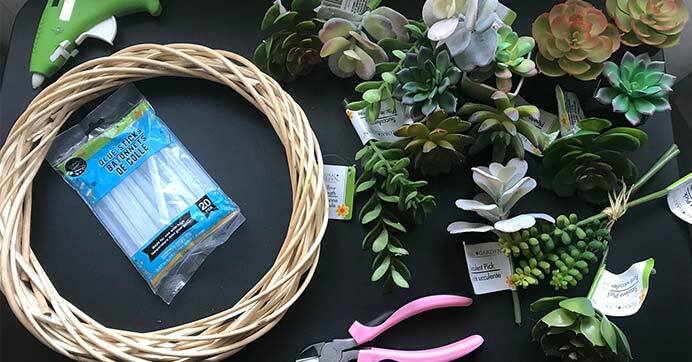 Get even more inspiration from other DIY wreath and succulent ideas on the blog.